REALiS 4K501ST from Canon USA The What: Canon U.S.A. unveiled the REALiS 4K501ST Pro AV LCOS Projector, which incorporates all of the same features as Canon’s current REALiS 4K500ST, as well as an enhanced video interface that offers two HDMI version 2.0 inputs with HDCP 2.2 support. The What Else: Other features include native 4K resolution of 4096x2400, up to 5,000 lumens and Canon’s LCOS Technology with AISYS enhancement for high brightness and detailed image reproduction. The REALiS 4K501ST also offers a Genuine Canon 4K lens and a robust collection of advanced image adjustment and professional install setting features, including Marginal Focus, which helps ensure content projected on the peripheral portions of domed surfaces remains in focus. At only 39.6 pounds, this model also offers one of the most compact and lightweight form factors of a high brightness 4K projector. At 4096x2400 resolution, the REALiS 4K501ST projector’s native 4K resolution is made up of more than 9.8 million pixels—higher than the Digital Cinema Initiative (DCI) standard for 4K cinema (4096x2160) and more than QFHD (3840x2160), the resolution standard for 4K TV. This higher resolution can be a critical factor for applications like simulation and training and design and engineering, which may require larger vertical display areas. 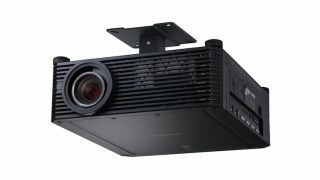 The 4K501ST projector comes equipped with a specially designed Genuine Canon 4K short-focus wide-zoom lens and throw ratio of 1.0–1.3:1, allowing it to project a 10-foot-wide image from an approximate distance of only 10 feet. This projection lens possesses advanced spherical focus capabilities derived from Canon’s renowned L-Series EF camera lenses, which are distinguished by a bold red ring around the outer barrel. The lens delivers high performance from Canon optical technologies like ultra-low dispersion (UD) glass, aspherical lens elements, and super spectra multi lens coatings. The lens also includes a Marginal Focus feature, which helps ensure content projected on the peripheral portions of domed surfaces remains in focus. The 4K501ST is the newest member of the REALiS Projector series, which all feature Canon’s LCOS (Liquid Crystal on Silicon) Technology with AISYS enhancement. This advanced technology, which is achieved by Canon’s proprietary AISYS (Aspectual Illumination System) Optical Engine maximizing the performance of three LCOS panels, is renowned for delivering virtually seamless images with outstanding color reproduction, and low-latency playback for improved display of video content. This unique engine is critical in helping to ensure the 4K501ST projector delivers an ideal combination of both brightness (up to 5,000 lumens) and contrast ratio (up to 3,000:1), while also helping the projector maintain a small form factor—an important issue for applications with limited spacing, and those that may require an upgrade of an existing lower-resolution unit of similar size. The 4K501ST projector is also able to deliver a virtually consistent level of brightness throughout its zoom range thanks to the combination of the AISYS Optical Engine and the advanced optical technologies found within the projector’s Genuine Canon 4K lens. The REALiS 4K501ST projector also integrates dual image processing engines that execute such complex tasks as smooth reproduction of uncompressed 4K video at up to 60Hz, and two upscaling technologies, BiCubic and Canon’s proprietary Sharp Trace, which detects contours of an image in a diagonal direction and performs interpolation, to help optimize 2K video and other non-native 4K resolution content. The Canon REALiS 4K501ST projector also offers six different preset image modes, as well as three customizable image modes, to help optimize quality based on content type and projection environment. The projector’s special DICOM Simulation Mode can be ideal for displaying monochrome digital X-rays, CAT scans, and MRIs with superb grayscale gradation. This mode, which offers both clear and blue base color temperature presets, simulates the results of devices compliant with the Digital Imaging and Communications in Medicine (DICOM) Part 14 standard. The small form factor and weight (39.6 pounds) of the Canon REALiS 4K501ST projector allows this model to be installed in a wide range of applications and environments. Motorized lens shift, zoom, and focus, 360-degree vertical installation, four-point keystone correction, and a variety of other advanced professional calibration settings provide further installation versatility, including built-in edge blending, which enables the projection of one seamless, large image from multiple projectors without the need of special software; and advanced registration, allowing independent position adjustment of the three primary colors (RGB) with high accuracy (0.1 pixel), ultimately helping to reduce blurred colors or lines often projected at the edge of an image. Industry-standard connectivity on the Canon REALiS 4K501ST projector includes two HDMI (version 2.0) and four DVI inputs supporting single, stripe, and cross configurations for 4K, 2K, or HD video playback. This model also supports PJLink, which makes it possible to control and monitor the projector over a network, making it easier than ever to observe lamp hours, usage, and more. For even more control, the REALiS 4K501ST projector is a Crestron-Connected device and supports AMX Device Discovery. The Bottom Line: The Canon REALiS 4K501ST Pro AV LCOS Projector has a suggested list price of $58,990 and is scheduled to be available through authorized Canon dealers by October. The REALiS 4K501ST’s compact size, capability to reproduce 4K content at 60Hz via a single HDMI cable, and its combination of image quality and advanced features make it accessible to a wide range of markets from museums and galleries to higher education, and specialized applications like immersive simulation and training, which require high image quality but may have limited spacing.